Together we make positive environmental impacts and energy savings. 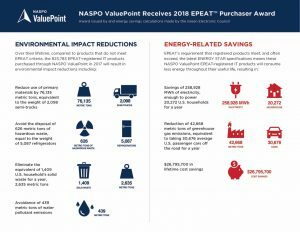 On behalf of the state and sourcing team work, and because of your virtuous procurements NASPO ValuePoint received a 2018 EPEAT Purchaser Award for purchases of sustainable IT products at the May EPEAT Purchaser Awards Ceremony in Minneapolis. The awards made by the Green Electronics Council (GEC) honor organizations that show leadership in the procurement of sustainable IT products and demonstrate NASPO ValuePoint’s commitment to maximizing resources effectively and efficiently. Awards calculations were based on ValuePoint’s Minnesota led Computer Equipment, Peripherals & Related Services and the Nevada led Copiers, Printers & Related Devices portfolios according to GEC spokesperson Jonathan Rifkin. They found 823,783 EPEAT-registered IT products purchased through ValuePoint in 2017. Award winners were recognized for their purchases in four IT product categories: PCs and Displays, Imaging Equipment, Mobile Phones, and Televisions. Each winner earned a star for each product category they committed to purchasing EPEAT registered products. NASPO ValuePoint was recognized at the two-star level for purchases. This award is just one of the many ways that we continue to demonstrate our leadership in sustainable procurement, as we are the only cooperative purchasing program to have received the award. We look forward to our continued procurement of sustainable IT products that offer both best value and environmental friendliness.